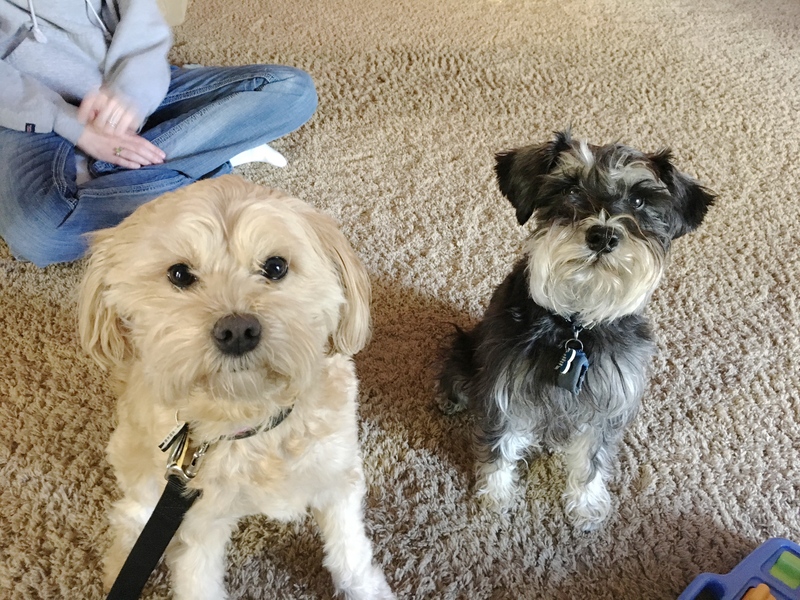 Ivy (left) is a two-year-old Shih-Poo who lives in Omaha with Ryder, a six-year-old Miniature Schnauzer. The dog’s guardians arranged for this dog obedience training session to help Ivy stop getting over excited, excitedly urinating, feel better about the kennel and address her Separation Anxiety. They also asked me to help Ryder stop being so fearful of unexpected noises. The dogs were very excited to see me and their behavior was pretty typical at first, but then Ivy decided to engage in some over barking. I set down with the dog’s guardians to discuss what she wanted to accomplish during our session. During that conversation I learned that the dogs did not have very many rules and work petted to such an extent that they didn’t even have to ask their guardians for attention. A lack of rules can give the dogs the impression that they have the same authority as the humans. When this is the case, then listening to the humans becomes optional for the dog. I suggested that the guardians start to incorporate some more rules and boundaries. This structure will help the dogs start to move into a follower’s mindset. Once the dogs identify as being in the follower position, then they will start listening to their humans more consistently. I also recommended that the guardian stop giving the dogs a command multiple times. When we repeat ourselves over and over (sit, sit, sit, Sit, SIT, SIT!!!!! ), it tells the dog that we are not that serious about what we are asking. Instead, I suggested that the guardian give the command word once. If the dog fails to comply within three seconds, the guardian should get up and start walking directly at the dog and not stop until the dog complies or find itself with no where else to go. Once the dog is left with no where else to retreat to, the guardian should give the dog the command again in a very stern and assertive voice. Only after the dog complies would the scenario be over. By consistently following through and making sure that the dog complies every time the human gives it an order, we can help the dogs understand that listening is no longer optional. This will dramatically help the dog’s see and respect their humans. I also suggested that the guardians start practicing my Petting with a purpose strategy. All of this structure should help alleviate a little bit of the stress that contributes to Ivy’s Separation Anxiety. Many dogs who suffer from Separation Anxiety go into a panic state when left alone as they think they need to watch over and protect their humans and when the human leaves without them, the dog thinks it needs to escape the kennel to go and find them. Another reason dogs suffer from Separation Anxiety is they haven’t practiced being left alone. Often accompanying that is not practicing being calm in the kennel. I knew I needed to address both topics in order to help Ivy. I have found that helping a dog develop more self-control can also go a long ways towards helping it get over separation anxiety. One of the most basic commands that helps develop self-control is teaching a dog to stay. The best way to teach a dog to Stay is to practice it in very short practice sessions a couple of times a day, every day. It’s really an exercise where one step builds onto another. You can find the original video that taught me the Stay technique by clicking this link. Because Ivy had a tendency to drool in the crate so much that her tail was dripping when the guardians got home from work, I spent a couple of minutes going over some crate training. Unlike most of the dogs that I work with who have a fear of the crate, Ivy had no problems going in. This is a good sign as it indicates that the crate itself is not the negative, it’s being left alone. I spent the next couple of minutes discussing how the guardian can help Ivy practice being calm inside of the kennel. This technique is really simple, but it does require a lot of repetition and practice. The good news is, if you don’t push too far too fast, it solves the problem for good. I shared the last few steps of this rehabilitation method in the following video. I suggested that the guardian enroll Ivy in a doggy daycare for the days where the guardian does not work from home while rehabilitating the dog’s perception of the kennel. You do not want to put a dog into the crate and leave it alone while you are conducting the kennel training that was outlined in the above three videos. We finished up the session by addressing one of Ryders issues, a fear of unknown noises. This counterconditioning technique can be applied to any noise or situation that startles Ryder. The guardian mentioned when they had some construction work done, the compressor really bothered Ryder. Whenever possible, recreating situations and counter conditioning a dog so it no longer reacts to the stimulus is always a great strategy. The key is to not push too far, too fast. If done properly, this technique will eliminate the dog’s fear of whatever the stimulus is, for good. By the end of the session, Ivy had settled down quite a bit. She seemed to be following her guardian’s commands and corrections much faster and was already starting to sit in front of her to ask for affection. It’s going to take a couple of weeks of practice, but because Ivy responded so well to the kennel training exercises, practice at that combined with the added structure should help her feel less anxious and needy. Once her confidence grows, her separation anxiety should abate completely.